(Nanowerk News) Winemakers have long known that blending different grape varietals can favorably balance the flavor characteristics of the wine they produce. In the future, makers of advanced biofuels might use a similar strategy, blending different feedstock varieties to balance the energy characteristics of the transportation fuel they produce. A collaborative study by researchers with the U.S. Department of Energy (DOE)’s Joint BioEnergy Institute (JBEI), a bioenergy research center led by Berkeley Lab, and the Idaho National Laboratory (INL) has shown that an ionic liquid proven to be effective for pre-treating individual biofuel feedstocks is also effective at pre-treating multiple different feedstocks that have been mixed and densified into a blend ("Impact of mixed feedstocks and feedstock densification on ionic liquid pretreatment efficiency"). 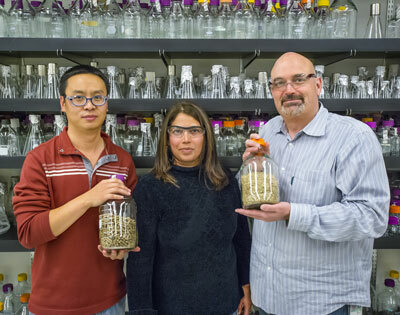 (From left) JBEI’s Jian Shi, Seema Singh and Blake Simmons successfully used an ionic liquid to pre-treat mixed blends of biofuel feedstocks, a key to future commercialization. Simmons and his JBEI colleague Seema Singh, director of JBEI’s Biomass Pretreatment group, led the JBEI/INL study in which four biomass feedstocks, representing the general classes of plants well-suited to serving as fuel crops, were mixed and milled into either flour or pellets then pre-treated with 1-ethyl-3-methylimidazolium acetate ([C2mim][OAc]), the ionic liquid used at JBEI as a benchmark for biomass processing. The objective was to determine the impact of mixing and densification on the efficiency at which the complex polysaccharides in cellulosic biomass could be converted into fermentable sugars for fuel production. Given that global temperatures are now setting record highs and that the burning of fossil fuels is releasing an additional 9 billion metric tons of excess atmosphere-warming carbon each year, both the planet and the American economy stand to benefit from a large-scale domestic advanced biofuels industry. Produced from the microbial fermentation of sugars in lignocellulosic biomass, advanced biofuels are clean, green and renewable, and could displace gasoline, diesel and jet fuel on a gallon-for-gallon basis and be directly dropped into today’s engines and infrastructures. The sugars in lignocellulosic biomass, however, are complex polysaccharides that are deeply embedded within a very recalcitrant material called lignin. To break apart the complex lignocellulose and help hydrolyze the released polysaccharides into sugars that can be fermented by microbes, researchers at JBEI and elsewhere have been studying biomass pretreatments with ionic liquids – environmentally benign organic salts often used as green chemistry substitutes for volatile organic solvents. The JBEI/INL collaboration mixed switchgrass, lodgepole pine, corn stover and eucalyptus in flour and pellets and within 24 hours of saccharification were able to obtain sugar yields of up to 90-percent for both forms. Pellets, because of their higher energy density, would be the preferred form.